If you don’t win this giveaway, make sure to enter Sussle’s Holiday contribution contest! Sussle is giving away $50 to the best contributors of 12 Holiday themes! If you have some great ideas, go here and add them! Tales From A Southern Mom has never heard of Sussle. It seems like a neat site to use. 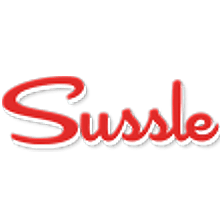 Have you heard of Sussle yet? It’s a great new website where YOU control the content! Think of it as an online encyclopedia where the very best of the web is added to it — images, videos, websites and more! I did a search for “crafts”. I was given the definition of what a craft was and then I was given a very long list of great crafts that my fellow “crafters” have submitted. Like what you see? You can rate each post and when you do, you are entered to win $50 via PayPal! Readers can even “pin” the ideas that they like right to their Pinterest as well! Do you have something interesting to add? You can do that too! The more you add, the more chances you have of winning their scholarship! So, add some of your own great ideas! Some of the best content includes information on art, tattoos, fashion, photography, music, nail polish, books, desserts, do-it-yourself and there is so much more. So, if you have a “niche” I would definitely encourage you to start adding some great new content to Sussle! Sussle doesn’t spend money on marketing or ads, they spend money on YOU – their contributors! 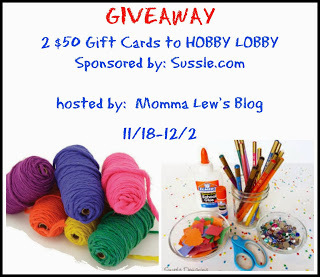 So as a thank you for contributing some great new content on their website, Sussle is offering 2 of my readers a $50 gift card to Hobby Lobby so they can get out there and create something new to contribute to Sussle! For your chance to win read below. Begins 11/18 and ends 12/2 at 11:59pm EST. Good Luck!! Disclosure: Tales From A Southern Mom is not responsible for prize fulfillment.